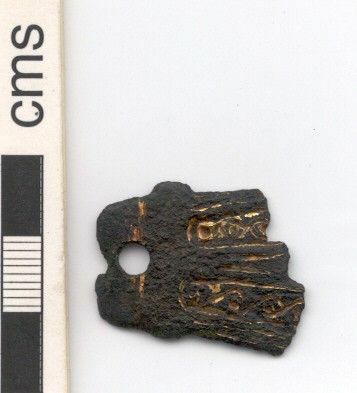 Copper-alloy mount, broken at one end. At the unbroken end is a circular attachment hole, 4 mm in diameter. The object tapers slightly from the wider broken end to the narrower end with the hole. At 7 mm from the complete end there is a knop at each side of the mount. The obverse of the mount is decorated with incised markings. These take the form of 'figure of eights' within two horizontal bands, assuming that one is holding the object with the attachment hole to one's left. Between the horizontal bands are two incised lines. This decoration is interrupted by the break in the object. A line also runs vertically across the artefact from immediately left of the aforementioned knops, interrupted by the attachment hole. Traces of gilding remain in all of the incised decoration. The reverse of the item is undecorated. On stylistic grounds the artefact appears Anglo-Saxon and the decorative design is similar in style to an example given in West, 1998, page 250; no 6. 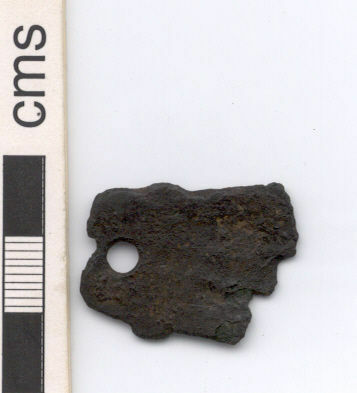 The object is 26.5 mm long and 20 mm wide. Ady wrote @ 16:25:42 on the 8th July 2010. This record has been looked at by Dr Steve Ashby and Dr Tania Dickenson of York University as part of my Study into Early Medieval PAS finds in Northamptonshire (See Masters Dissertations in Research section). There is nothing more to point out except that there is a slight possibility that the decoration is two birds facing each other.. The beaks toucing above the hole.